Discussion in 'Boxing Discussion' started by Cheese, May 23, 2014.
Who would win if Gatti or Ward fought Provodnikov. I think Gatti take Provo but Provo would beat Ward. agree - but provo would be beating ward then get hit with the hook to the body and get ko'd. Gatti vs Ruslan is 50/50. Ward loses. Gatti would have to outbox Ruslan to win. I don't see him winning a fire fight. I'm not so sure Ward loses either. Do you guys think Provodnikov could break Ward before gassing out? 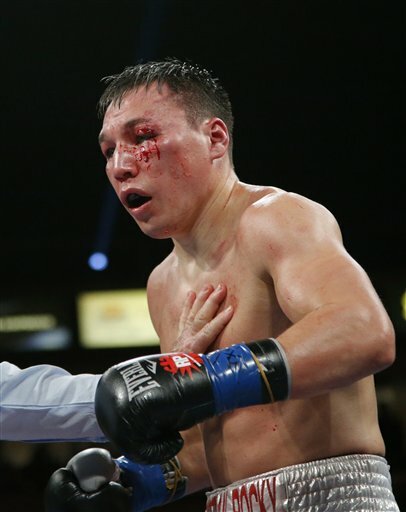 Provodnikov starts strong, gasses and gets beat up by both. Please this is a guy who couldn't stop Chop Chop and I'm not talking a long time ago. Ward and Gatti would beat him into a bloody mess. There's a reason he was so scared of Rios and is fighting prospect Algeri. Based on what? Seriously these hype jobs are becoming a disgrace to boxing. Lol at those who favored Alvarado over him. Provodnikov is all power. Gatti could take everything Provodnikov could dish out and come back throwing KO shots in the 11th. lol at those who think Provodnikov is special for beating Alvarado and having a couple of good rounds against Tim Bradley. Tim Bradley did this to him, seriously anyone who thinks Provo beats Gatti and Ward are HBO zombies. Had the fight been stopped in the first very few would have objected. Agreed. Tim Bradley fighting him like a tard made him a star. Bradley is a great fighter and used great combos. Why is this surprising? You know why they are hyping Ruslan as a killer? Because Manny will fight Ruslan if Marquez won't do 5th fight. Their trying to say Ruslan is better win than Gatti. Ruslan is dangerous for anyone in his weight class....this is why jmm clearly ducked him. I wouldn't want to see manny fight him either. They don't get that, fighting that way got Bradley 9 million for the Manny and Marquez. They don't get Ruslan isn't that good. Bradley wasn't even a knockout guy at 140, what you think Gatti and Ward will do? Punch him in his face till the doctors stop it and Ruslan's face is damaged.